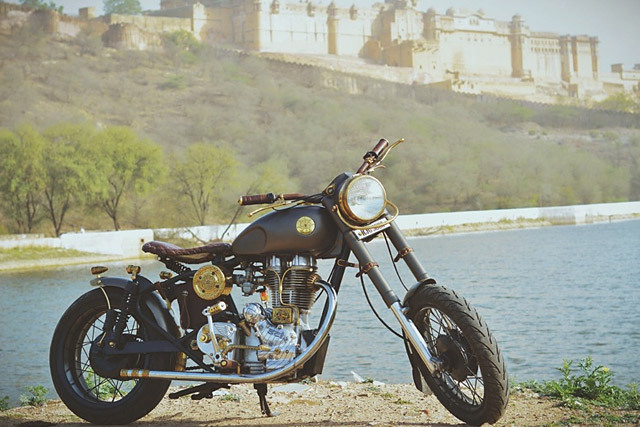 Dreamed up in the war time era of the 40’s, built in 1980’s India and customised in 2014 using bronze making techniques thousands of years old this Enfield has one hell of a story to tell. 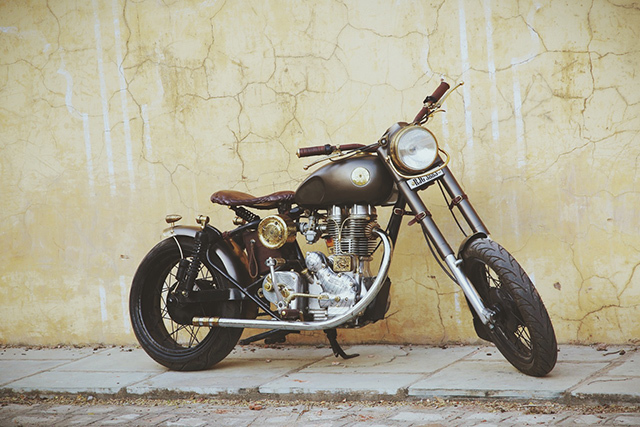 Customising a bike for the first time was a harder road than builder Chetan Yadav of Sisaka Custom Motorcycles ever imagined and getting his hands on his favourite bike was just the start. 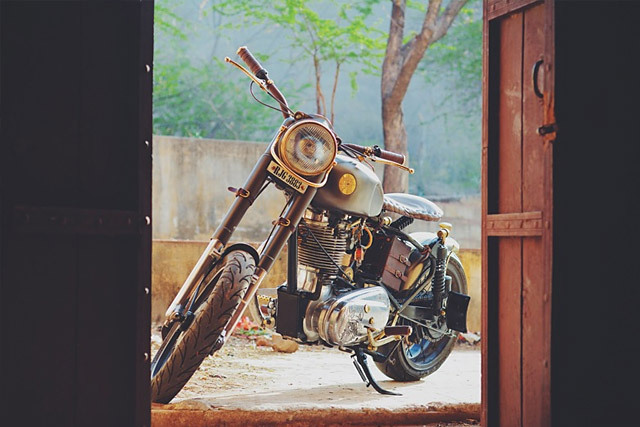 It was a journey a year long, testing his patience, requiring MacGyver like resourcefulness and taking lessons from builders past and present, but what he has constructed is a 1983 Royal Enfield like no other. 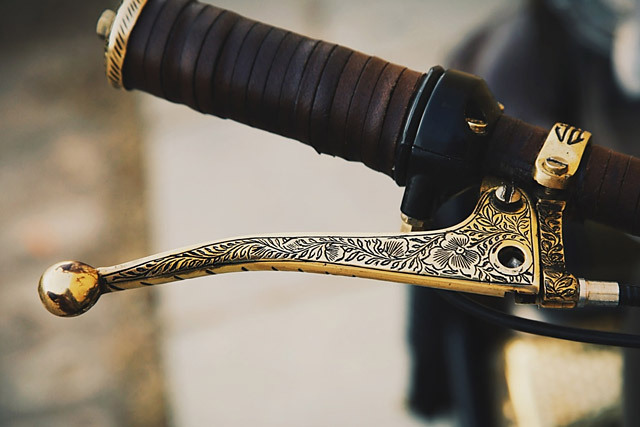 The bronze gives the bike a distinctly Indian look, utilising the nations favourite metal to fashion high quality pieces that adorn the bike and with thousands of years of bronze making tradition the level of detail does the history justice. From the exquisitely engraved headlight surround to the ornamental air filter, wherever you look is a piece worthy of being its own unique sculpture. 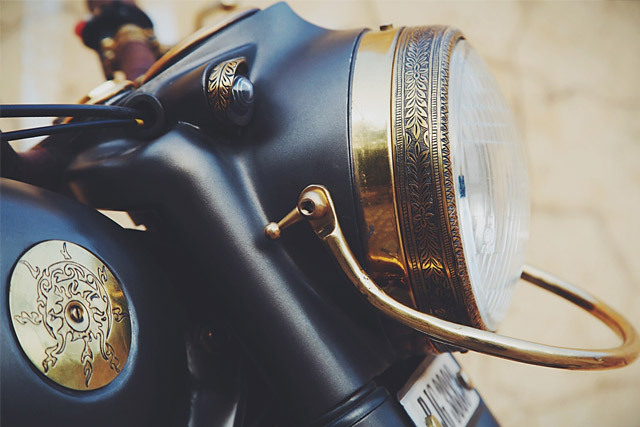 From the bold gas cap to the delicately crafted levers, the rear tail light and indicators and the kick start, each piece has been lovingly formed. 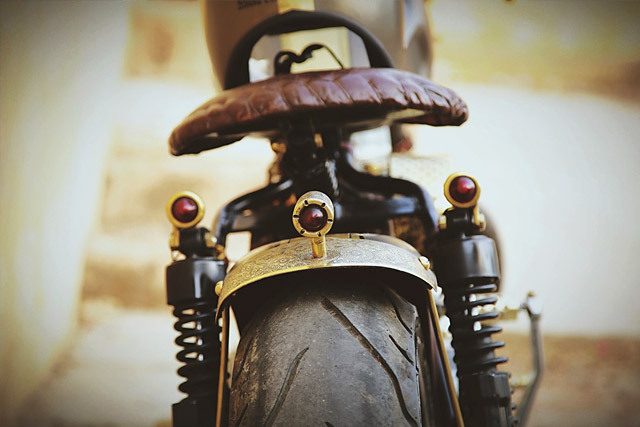 But it’s not all in your face, there are the front indicators that you notice only after admiring the bike for considerable time, the subtle oil lines and that rear fender that reminds you custom bike building really is an art form. 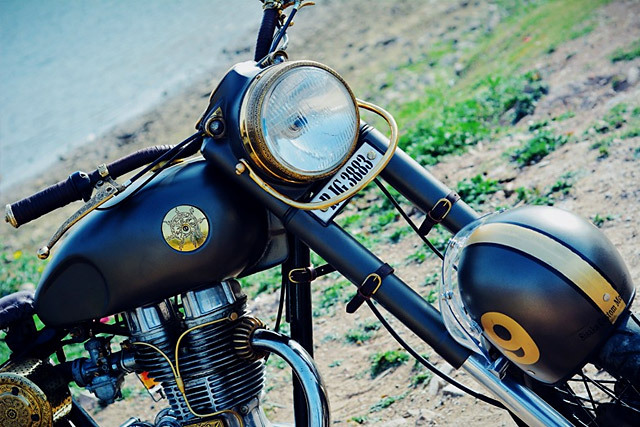 To steer his ride around the rapidly growing city of Gurgaon, Chetan utilised a set of Yamaha FZ150 handle bars that have been leather wrapped, matching grips and bar ends made out of you guessed it, bronze! 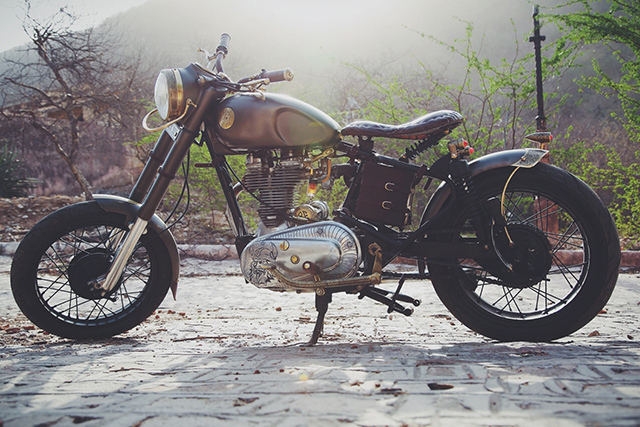 Hiding the ignition key and battery is the industrial tool box, it to wearing leather, while further enhancing the bikes bobber credentials is the painstakingly hidden wiring loom. 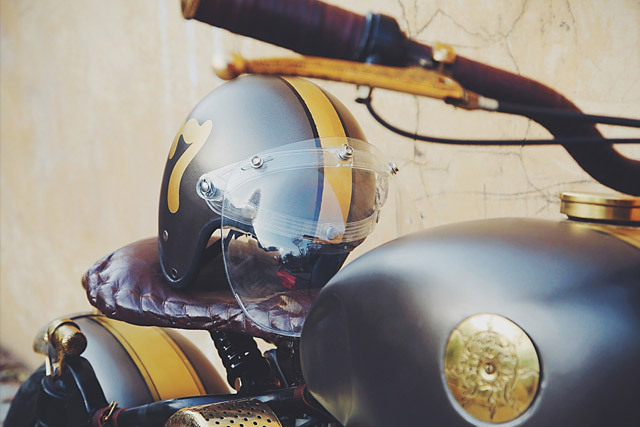 Keeping the rider informed is a Vintage Smith replica speedo that makes picking the age of the biker even harder. 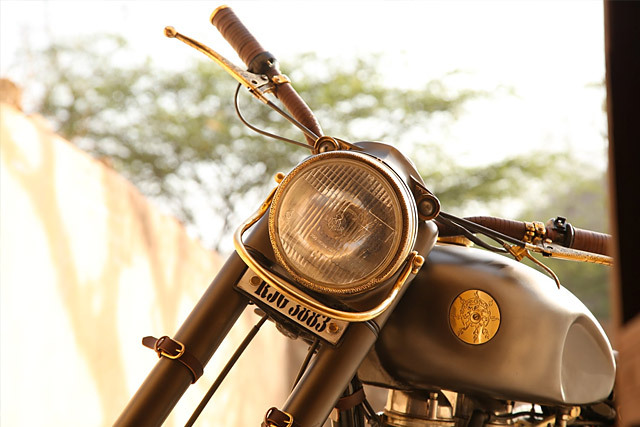 While the custom exhaust with bronze accents makes sure heads are snapped around in time to see the Enfield coming. The wider than stock rear tire is a 150 section plucked from a KTM Duke and fits snuggly on the custom laced and painted rim. In a scene of many bikes where a few distinct styles often rule the roost it can be easy to get caught just following the pack. 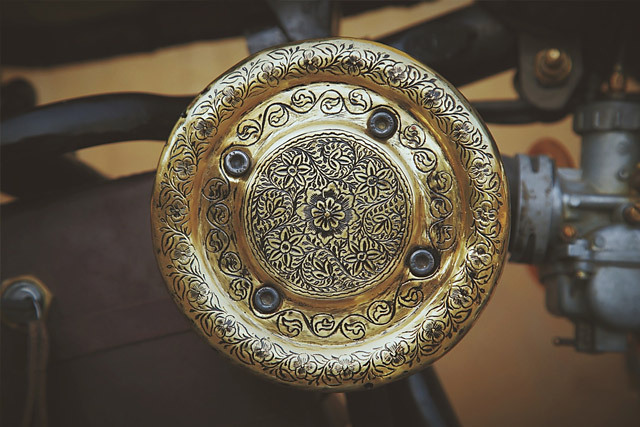 But inspired by his favourite builders, influenced by his culture thousands of years old and determined to build the bike he’d always envisaged, Chetan put the rule book aside and like the sculptors of old, he fashioned something truly unique. 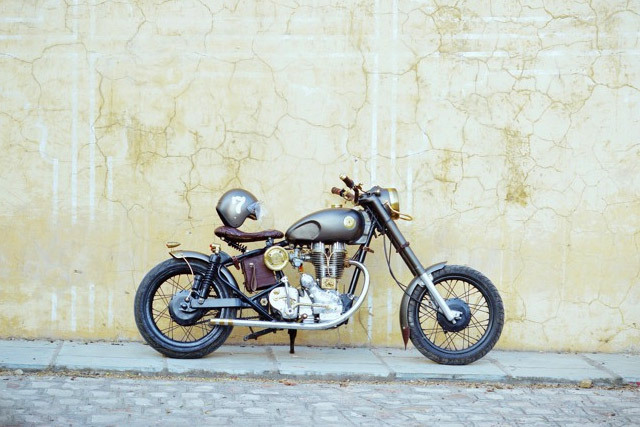 A leather bound, bronze clad steed that has this Royal Enfield riding at the front of the pack!